Anonymous, original tintype, 5.75" x 4.5". Part of an 1860s style frame is visible.. It's in very good condition with a couple of very light bends in the bottom-right, and bottom center. The diagonal line between the K and M in my watermark is NOT a bend. 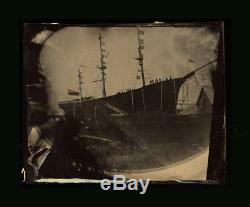 The item "Rare 1860s 1870s Tintype Photo Tall Ship with Sailors on Board Perhaps Civil War" is in sale since Saturday, March 24, 2018.